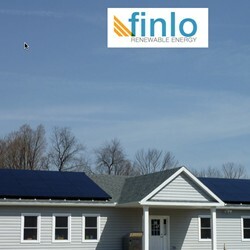 Installed by Finlo Renewable Energy, the town’s 12.6 kW photovoltaic system comprises (60) SunPower 210-Black modules and (2) SunPower 6000m inverters. The module mounting system features all-aluminum racking with stainless steel fasteners. The array is mounted off the roof to allow increased air circulation under the array. As the temperature of PV cells increase their efficiency decreases. The roof standoffs allow the array to stay cooler and produce more power than typical flush mount PV systems. Included in the Town of Caroline’s system is a data acquisition system (DAS) which provides real time data display via the internet, hosted and maintained for free at the SMA /SUNPOWER website. The DAS system provides irradiance, and temperature collection in addition to real time and historic energy production numbers. The entire installation is designed and materials are specified for longevity; the modules have a 25-year power output warranty, the inverters have a standard 10-year warranty. Our warranty covers all labor and materials for 5 years.